Welcome to Norris Public Power District! All customers wishing to receive electric service from Norris Public Power District must complete an Application for Electric Service and pay the applicable deposit as outlined in the District’s Service Regulations. All Service Regulations are Board approved and are frequently reviewed. To apply for service, complete the online form below. If you have any questions regarding the form, please contact a Customer Service Representative at 800-858-4707 between 8:00 a.m. and 4:30 p.m.
A $25.00 service connect charge will be added to your first electric bill. A deposit may be required for service. Upon receipt of your Service Application a District Representative will contact you to verify your account information and review the customer deposit requirements. An Application for Electric Service may also be completed, in person, at one of the District offices located in Beatrice, Hebron, Roca or Seward during office hours. Provide cell phone provider (Verizon, U.S. Cellular, etc.) if you wish to elect to receive outage update notification text messages. The co-applicant is also responsible for payment on the account. Service start date must be a current or future date. We cannot back date. Holiday and weekend requests will be scheduled the next business day. 1. In consideration of the District making electric service available, the applicant will purchase from the District electric energy and pay in accordance with the applicable Rate Schedule and Service Regulations of the District. 2. Electric energy furnished by the District shall become the responsibility of the applicant after it passes the meter. The applicant shall be responsible for operation, maintenance, replacement and renewal expenses on all customer-owned equipment, including all equipment beyond the metering point provided by the District. 3. The applicant hereby subscribes to the Norris Electric News and authorizes the District to include publishing costs in the applicable Rate Schedule. 4. The District shall have the right of ingress and egress on the above mentioned applicant’s property for the purpose of constructing, operating and maintaining their line, including the right to cut, trim or remove trees, shrubbery or other obstacles necessary to protect the District’s lines and facilities. 5. All new services must be approved by the District’s engineering department and when District policy requires, the customer shall sign a contract and make all payments specified by District Service Regulations before start of construction of services. The initial billing period shall start when customer begins using electric power and energy, or thirty (30) days after the service is available hereunder, whichever shall occur first. 6. The District reserves the right to deny or terminate electrical service to the customer at any location within the District’s service territory for non‐payment of charges arising from this application or any other contract entered into between the District and the customer. 7. The District reserves the right to provide renter service information to property owners or managers upon request. If you choose not to participate in the following programs/services, please uncheck the box(es) above. 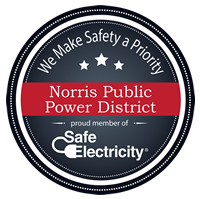 By providing Norris Public Power District your phone number, you are giving express written consent to call or send electronic notifications regarding your account to the number provided in the Applicant's information.